Review Following the fashion set by LG with its Prada Phone, Samsung has become the latest mobile maker to bring together couture culture and touchscreen technology. Running up its own style-savvy Giorgio Armani number, Samsung has embraced the iconic Italian fashion house chic for this premium label handset. Not surprisingly, the Giorgio Armani-Samsung phone has drawn plenty of comparisons with the Prada Phone and, of course, that other well-known touchscreen handset, from Apple. Like the other pair, this phone doesn’t include 3G technology, nor is it Wi-Fi enabled as the iPhone is. Its feature set is pitched at a mid-tier Samsung Ultra level, squeezing a three-megapixel camera into its slim aluminium and stainless steel frame and packing in music player and video functionality alongside a familiar spread of features. 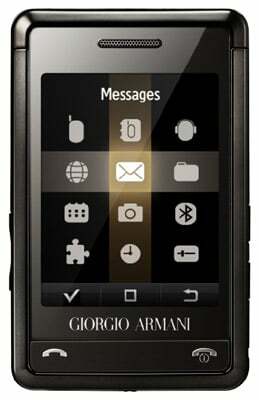 The Armani phone - aka the Samsung SGH-P520 - is a slim, neat and tidy design, and with a footprint of 87.5 x 10.5 x 54.5mm and 85g weight, will slip smoothly into any pocket or purse. Based on Samsung’s touch-operated Croix user interface, the phone’s front is dominated by its large 2.6in, 262,144-colour, 240 x 320 display, with just tiny call and end keys popping up on the bottom of the face. The OS is the dominant aspect of this phone - anyone trying it out will judge it on its operational ability as much as on its well-attired first impressions. But many buyers will pick this phone for the appeal of its prominent Armani logo, its clean lines and stylish yet subtle bronze-grey finish. After all, that’s what fashion’s all about. And there’s no mistaking the style element at play, from the luxury packaging to the leather case and cloth holders for accessories and handset. All branded, naturally.